The Polysiloxane backbone of this coating provides chemical resistance and has more porous resistance to hydrocarbons and other chemicals, and that makes it easier to clean and more durable. It offers unmatched color retention, meaning decks won’t get as hot and won’t increase the thermal load on the rest of the ship. Next, SiloxoGrip retains a high coefficient of friction in wet and dry environments alike, making its non-slip and non-skid properties more effective than ever. Finally, this product looks great. Siloxogrip coating is amine blush resistant and easy to apply, so it’s ideally suited for highly humid and low ambient temperature industrial environments. New low viscosity ingredients make application easier than ever. 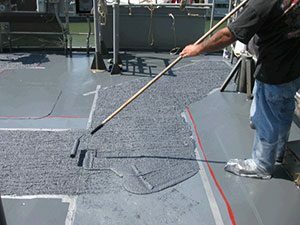 SiloxoGrip provides the nonskid and nonslip coating needed for some of the world’s harshest environments. This deck coating lasts more than three times longer than less advanced epoxy resins. We meet all NRL and marine specs. Mix for at least five minutes, and then paint or spray on for quick and lasting results. Don’t leave the glossy finish, durability or true pigment of your deck coating up to chance – rely on SiloxoGrip, the global leader in polysiloxane coating.